With a single and secure imaging platform, Agfa HealthCare enhances multispecialty visualization aligned with leading value realization models. Modular Enterprise Imaging platform simplifies access to a unified patient imaging record, empowering informed decision-making for radiologists and other physicians. Agfa HealthCare is developing bringing AI to the modality level to enable "first time right" imaging in optimal conditions. (RSNA, South Hall, Booth #3300) Visitors to RSNA 2018 will discover how Agfa HealthCare is bringing intelligence to healthcare IT and imaging, to improve the delivery of patient care and enhance productivity. Agfa HealthCare solutions deliver visual intelligence that supports informed decision-making, enabling "Care You Can See." Enterprise Imaging is a completely integrated yet modular solution that allows healthcare facilities to enable an imaging ecosystem at their own pace. Enterprise Imaging leverages Agfa Healthcare's purpose-built task-based rules engine, multispecialty visualization, advanced clinical applications and optimized triage workflow. Native and and third-party AI applications, a work in progress (*), will help enable fast access to relevant clinical information, to advance the delivery of cost effective quality patient care and improved productivity. The platform supports multi-specialty collaboration to help radiologists and other clinicians meet enterprise wide strategic initiatives. Agfa's comprehensive direct radiography portfolio and technologies deliver high-quality imaging, while improving workflow and user satisfaction. Each comes with MUSICA image processing and a choice of fixed, tethered and wireless detectors with Cesium Iodide (CsI) or Gadolinium Oxy-Sulphide (GOS) technology. CsI also offers the potential for dose reduction. Agfa is developing products that bring Artificial Intelligence to the modality level – before, during and after exposure – to enable "first time right" images in optimal conditions. This intelligence is powered by the MUSICA self-adaptive image processing technology. The functions embedding Artificial Intelligence will focus on quality, and productivity, to improve the imaging experience of patients and staff. Data analytics tools use the information in the DR record to create meaningful reports for optimizing radiology efficiency. Artificial Intelligence at the acquisition is a works in progress. R&D representatives will be available at the Agfa RSNA booth to discuss further details. "Agfa HealthCare is fully committed to delivering AI in the clinical environment, and beyond," describes Luc Thijs, President of Agfa HealthCare. "These technologies have the potential to make a significantly positive impact on a patient's course of care, treatment, and satisfaction, and on the care provider organizations' clinical, operational and financial well-being. Furthermore, we were proud to have recently been identified by KLAS as a "strong and guiding partner" that supports our customers to establish their successful Enterprise Imaging strategy. This recognition of the success of our approach and expertise validates our continued efforts to innovate in ways that make a tangible difference." 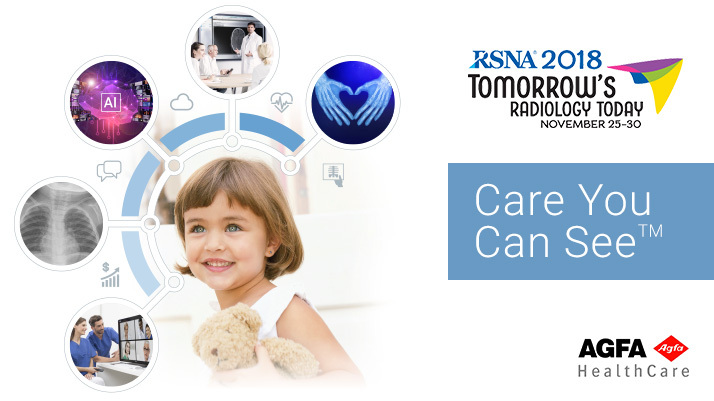 To find out more about how Agfa delivers visual intelligence for Care You Can See, visit us at RSNA 2018, 25-30 November, Chicago, IL, USA, South Hall, Booth #3300. Testing with board-certified radiologists has determined that Cesium Bromide (CR) and Cesium Iodide (DR) Detectors, when used with MUSICA image processing, can provide dose reductions between 50 to 60%, compared to traditional Barium Fluoro Bromide CR systems. Contact Agfa for more details. KLAS Performance Report 2018, "Enterprise imaging 2018: How top organizations and vendors are achieving outcomes"